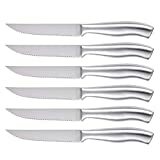 The Bellemain Premium Set is our pick for the best steak knife set, which is made with surgical grade stainless steel, each with a serrated blade, and amounting to four in the set. It can be used for cutting steaks and each is a full-tang knife with great stability. Our step-up pick is the J.A. Henckels International and it has a total of 8 in the set. All the riveted handles are triple in construction, and each are serrated as well. All of them have a stamped construction and each blade has a length of 4.5 inches. The budget pick is the isheTao Knives Set and it has an ergonomic handle that is also made with stainless steel. Each of the 6 knives are rust resistant and measure a standard of 4.5 inches in length. Each of them can also be washed in the dishwasher and has a limited warranty. 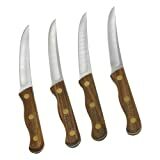 A steak knife set is a kind of cutting dinnerware that is used for cutting meat, especially steak. This kind of utensil is different from other cutting utensils because it is tailored and made specifically to cut meat products, especially brittle ones. The sharpness, therefore, must be very good in order to avoid the tendency of bouncing back, which is the usual cause of injury, whether in the kitchen or in the dining room, when you are cutting steak. It usually has 4 to 5 pieces in one set, depending on the purpose and the price. The pieces can vary in length and style, and can be made for different types of meat and recipes at hand. While these sets can make a great wedding gift and a display item at home, it can also be useful when meticulous guests arrive and they need legitimate and quality made steak cutting utensils at hand. For restaurants, this is a must-have to uphold the quality and dignity of their business for reserved guests. In any kind knife or cutting utensil, you need to consider the quality of the stainless steel. The grade of stainless steel is what makes the knife much better than others. While cheap ones are made of carbon steel, high quality stainless steel ones are usually found on expensive dinnerware. They tend to be heavier if they are made of better materials, so the grade can sometimes be measured in the heaviness of the aforementioned utensil. A knife can either be half or full tang. The tang is the part of the knife that extends to, and is riveted into the handle. The full tang one is a lot safer than the half tang one, simply because of how it has been attached to the handle of your cutting utensil. On the other hand, there are also some cutting knives or dinnerware that are fully stainless steel in their handle and blade head. These are usually found in higher end items and utensils out there. The handle is usually made of wood, but some of these utensils are made with a full stainless steel construction. The wood handle is a good choice, but make sure that it is quality wood so that it will not easily deteriorate when the time comes. Plastic handles are also okay, but make sure that they will not be made of toxic materials so that they will not be harmful to your food and to your health overall. Both provide good stability and durability overall, but it still depends on their quality, as some plastics are strong and some wood species are inferior in quality. In cutting steaks and meat, safety is always a must. Safety should be exercised in the kitchen, even when you are in the rush to preparing meals for your family or even for a restaurant. Cutting tools are always dangerous, and it takes years of training and practice in order to get the precise cuts that you want and need in the fastest time possible. Chefs around the world have been doing so, and that’s why you shouldn’t compare your skills and speed to them. Knives can be dangerous if you don’t hold them properly, and it also pays to have a quality knife that will let you handle it smoothly with less likelihood of injury. Number of knives in the set: usually, you will encounter about 4 to 5 utensils in a set, depending on its price and purpose. For commercial use, they usually have more pieces, and tend to be more expensive as a whole. The number of pieces does not always affect the quality, but if you do need more types of knives in the long run then you will definitely need a bigger set. Grade of stainless steel: the grade is usually measured in numbers. The higher grade ones are much better in terms of durability because they can possibly last for years without getting stains and corrosion. It is important that if you want your utensil to be a lifelong treasure, you should invest in a slightly higher priced but durable and quality one to meet your everyday needs. Half or full tang: whether it is a half or full tang, you must consider the construction to make sure that it is of quality build and will be safe to use. Any utensil that has not been properly riveted or fastened together could be dangerous if you continue to use it for longer periods of time, especially for commercial use. You should definitely look into full tang ones if you want to use it for restaurant purposes because those kinds of knives are usually the most durable of all. Construction of the handle: like we said above, any kitchen cutting utensil must be durable and safe to use, especially with the handle, which you will use to manage the utensil in every kitchen or dining table task. It is important to know the material that is used for the handle, whether it is plastic, wood, rubberized or ceramic. It is also important to have one that has an ergonomic shape to ensure that the proper grip is made. Most will have rosewood handles, pakka wood, polyoxymethylene pom and can also be triple riveted. Home or restaurant use: you have to consider whether your utensil is for home use only or whether it is for restaurant use. You should know whether you will be using it on a daily basis or just every weekend or so. This will help you to decide on the durability, the price and the amount or number of utensils there are in the given package. Responsible and safe packaging: you should also consider the packaging, especially if it will be a gift to someone. A steak knife set is usually a gift for the newlyweds, like most kitchen utensil packages. Therefore, it must be presentable in a clean and safe packaging, and should not damage the knives or damage the handler of the package. Everything must be secured and in order to make it worthy to give and to have for one’s home or business. These cutlery sets can also make great Mother’s Day gifts. As our top pick, the Bellemain Premium Set is made with surgical grade stainless steel so that it is quite durable and can withstand many uses, whether for home or for commercial use. It is a set of four in just one package, and all of them work perfectly for any steak or meat recipe possible. They also feel comfortable in your hand when you hold them. Each of the knives in the entire set is a full-tang knife, and they are also so luxurious and quality made that they will make you feel like in a five star restaurant. The superior strength and durability is what makes it stand out from the competition while you also get less sticking due to the hollow ground. In addition to that, the fact that it is made with ice-tempered steel makes it more durable than those with heat tempering. In addition to its rust-free qualities, the sharpness of each blade is so good that it can cut really well on just about any kind of steak recipe. It has been designed ergonomically so that it will not be too hard to grip. Moreover, putting them in the dishwasher is also safe due to the construction, so that they will be easier to clean overall. The only con but not a deal breaker with the Bellemain Premium Set is that it only has four in the set, but it isn’t a big deal because it is really a durable and sharp set, anyway. The J.A. Henckels International is our step-up pick, which has large serrations and followed by micro serrations as well, so it is unique in terms of the serration or edging of each of the blades. It can be a great gift for newlyweds due to the packaging, as well as the amount of knives in each of the set. Because of its durable design, it can resist corrosion due to the quality stainless steel material. It has smaller serrations, too. Made with a stamped construction that is of quality and uniform design, the sharpness is also pretty good and superior to other cheap knives out there. And also because it is a full tang set, it can be more stable and less likely to break apart as compared to half tang knives out there. In terms of maintenance, each of them are dishwasher safe and can withstand many cycles through the dishwasher. Each at 4.5 inches in terms of the length of the steel blades, all of them can stay sharp for years with proper care and use. Each of them also have a three rivet handle that is fastened carefully. With designs that fit any kitchen, this set of eight can be useful for any household. All of these knives do not seem to lose their sharpness due to the construction, as said by most users and reviewers out there. Being triple-riveted handles to maintain stability, the company also has a lifetime guarantee or warranty for the product. Our budget pick, the isheTao Knives Set, is made with high quality 420j2 carbon stainless steel, so it is quite okay for its price and still durable and also comfortable to hold. It will never need sharpening because of how each blade is constructed, and it also resists tarnishing due to the material used in making the stainless steel material. If you prefer serrated in your dinnerware then this is the set to have. It is also rust-resistant in every way due to how the steel was constructed. In addition to that, the 18/0 stainless steel knife handle also adds comfort without having to feel awkward with a bolstered knife handle that is made of wood or plastic. It has very sharp blades that can be easy to clean and to maintain. As a one piece construction that is a no-fuss set with less maintenance, each of them are also classy looking in terms of design, and work well for steaks due to the inclusion of micro-serrated edges. Each of them are quite sharp and comes as a 6-piece set, so you can choose from different ones. All of them can be washed in the dishwasher for ease of maintenance. You can also keep your fingers safe with the full bolster design. In addition to that, each of them are equipped with a 4.5″ knife blade that has sufficient reach. The finish or shine can hold up well for many uses and each of them have an ergonomic handle. It is backed by a lifetime warranty. 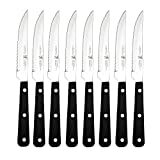 the AmazonBasics Premium 8-Piece is a set of serrated edge kitchen utensils, which come with a total of 8 steak knives for your kitchen needs. Each of them are full tang so that you can use them without worrying about the blade coming off the handle too easily, as compared to half tang. It is made with a triple-riveted handle construction on each of them. Measuring a total of 9 inches from end to end, this makes them better in terms of reach as compared to small knives out there. The included micro-serrated edges never need sharpening so that you don’t have to worry about sharpening them constantly in a knife sharpener. Whether you have old or new recipes involving steak or meat, this definitely has a good weight and balance that will be quite easy to handle. Each of them are also a single piece construction kitchen utensil and they also have some weight to them so that they will have good handling overall. You can make this into a great addition to your existing silverware due to the fact that it is made with stain-resistant steel. Each of them are also a full bolster construction material. Do know that this is a hand wash only utensil so be sure to wash it properly. The Messermeister Avanta 4-Piece is a set that comes with fine edges instead of serrated ones, for those who would like a cleaner cut instead. Each of the blades span up to 5 inches in total, and each of them have a fully exposed tang in terms of design. It also has a sleek and modern handle so that it is not just functional, but also attractive in the kitchen. Bearing a fine edge, each of them can give a nice weight and feel in your hands overall, in terms of handling. In addition to that, separating meat from the bone can be a breeze because of the design of the fine edge of each of them. They were made for those who prefer slicing and carving with a kitchen utensil such as these. They can make very clean cuts without tears and ridges, while the durable pakkawood handle keeps your hands comfortable because of the ergonomic design. It also has a special boning tip for those who just want to bone their steaks or meat and fish items. Each of them are also rust resistant so that they can survive for many years of usage, and can be sharpened again and again. With an upward curved tip, it can easily process steaks and other foods and can allow you to work on boneless sections of meat. It does not compromise in quality and materials and it can be oiled with food-safe mineral oil. Each of them are made with German steel and are easy to maintain overall. It is backed by a lifetime warranty for material and manufacturing defects. If you want a set that comes with solid walnut handles for a classic and rustic look, then the Chicago Cutlery #B144/1104670 can be for you. It can make a great gift for a wedding ceremony or for any household due to the design of each of the cutlery. Each of them are also a full tang blade for added durability and stability. Each of them also feature easier re-sharpening so that you don’t have to maintain them as hard as other blades out there. Moreover, the taper grind edge technology allows you to keep them sharp as long as possible without too much re-sharpening in the long run. This means that you spend more time cutting meat rather than having to sharpen it in a knife sharpener. It cuts fairly well and is a set of four utensils in one package. Each of them are made with high-carbon stainless steel blades that are slightly cheaper but still very durable nonetheless. For those who are wanting a better knife but do not want to spend a fortune for a set, this is a way to go. Each of the blades are 11/16 inch at their widest so that they can easily slice and pierce through any kind of steak or meat product. Also, because it can cut through meat, it is also given that it can also cut into a loaf of bread. In fact, most people who have reviewed this product claim that it is better than knives of comparable prices. The DALSTRONG Gladiator Series comes with sheaths for you to keep your knives protected as much as possible, without getting stained while being in stock or not in use yet. This makes them more functional instead of having them exposed in the elements, which can render the sharpness dull later on. Also, the hardness and flexibility due to the tapering is also enhanced due to the German design. Additionally, each Dalstrong steak knives have been hand polished to a satin finish under a 55 Rockwell hardness scale, making them quite a standard in terms of kitchen cutlery making. In addition to that, high-carbon German steel (ThyssenKrupp) has been used into making each of the blades for added durability and stability, all of them being expertly heat treated so that they can withstand the test of time and excessive usage. Maintaining stability due to being a full-tang set, each of them have already been re-sharpened prior to use. Made with a quality stainless steel second bolster to make sure it is durable, each edge measures 5 inches so it has a long reach. With a design of 18 degrees of serration per side, it can be easily handled due to the comfortable pinch grip for the polished spine part. As a set, there is no sharpening is needed for each of the knives, allowing you to save more time and energy in the process. Also, it is made with luxury packaging that can make it into an ideal gift for weddings and the like. Moreover, the whole package fits most existing knife blocks. 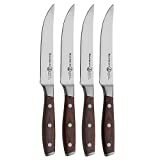 The Wusthof Gourmet 4-Piece is a full tang set of four knives, each of which are measuring 4 and 3/4-inches each. It is a great utensil set that can be used for cutting steaks. What’s more, you can also use it in various food items and preparations, such as chops and roasts. In fact, making any kind of food into bite-size pieces can be easy due to its sharpness. Each of them is made of high-carbon steel blades, so that you can depend on their durability without spending too much money in the process. Each of them are also full-tang, and are equipped with a 3-rivet, poly handle construction, which makes them stable, durable, ergonomic and easy to handle overall. Like with most of the same kind of handle, hand washing is greatly recommended over dishwasher because it can help you to prolong the lifespan of your kitchen cutlery. This Wusthof classic ikon can be sharpened with a sharpening steel, or used along with kitchen shears. If you want a set of knives made with a one piece construction to avoid detachment from the handles, you can count on the Ashlar Steak Knives as set of table knives for you to use at home or in a restaurant. It easily complements most silverware due to the simple and elegant design, and is also functional as a package of kitchen cutlery for cutting meat products. It works well for all meats and meat recipes due to the good sharpness. Each of them spans up to 8 and 3/4 inches long, so they can have a longer reach. Also, all of them are rust resistant so that they can withstand longer use for years, while cutting pork and lamb, and even chicken and other meats. It has a well balanced weight so it will not feel too heavy for your hands overall. With a good serration design, it can be useful when slicing tomatoes in the kitchen or preparing other food items. In fact, for the construction of the blades, the stainless steel type 3CR13 is used, quite like the quality of 420J2 (AUS 4) stainless steel. It can be useful in any special occasion and has a finely tapered tip that keeps it sharpness very well. It also has a lifetime warranty. The Flying Colors Laguiole is a set that comes with a wood block, for ease of storage. Each of the knife has a 1.5 mm for the thickness of each blade, with a total of 6 pieces in each set. The quality stainless steel blades are sure to cut away at any kind of kitchen preparation food item, especially with steak and meat recipes. Each in the steak knives set measure 9 inches long so you can use it for a longer reach in salad making and in other recipes in the kitchen. 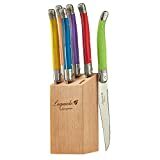 The wooden knife holder makes things organized and the ABS plastic handles allow a balanced weight and a colorful design, while retaining a gleaming and sharp set of blades and edges overall. The triple compression rivets are made of stainless steel as well. With this Laguiole steak knife set, the included knife block measures 2.4 x 5.3 inches so it doesn’t take up too much space overall. What’s more, the block prevents accidents to ensure that there is safety and stability in your kitchen. The whole set is backed by a 60-day risk free warranty. There were other sets that were not worthy in our list because they had reports of missing parts, irresponsible packaging and low quality construction. It is important for any utensil for cutting meat to be durable and can withstand the test of time and many uses. Q: What is a steak knife? A: A steak knife is a kind of utensil that is used for cutting meat products and other recipes related to it. This kind of kitchen utensil is usually given in sets but some can be standalone, depending on the needs. Most will have it at home but others can even have it in a restaurant, especially in a high class one. Q: What’s the difference between forged and stamped kinds of steak knives? Forged knives Forged knives are known to be more costly in terms of price as compared to stamped ones, because they take a lot of effort into shaping them. In addition to that, they are also much more durable than stamped ones, due to the thickness of the material that was forged. The handle and heel parts of the knives are usually fastened with a bolster material, making it different from stamped ones. The blade of the forged type knife is usually heavier and thicker in diameter, hence it tends to be more for the heavy duty side of things. Stamped knives Stamped knives are like cookie cut steel knives that are usually cheaper than forged knives due to the production costs better and simpler. They do not have a bolster in the construction, making them quite different from the forged knife, which has one. The balance of a stamped knife may not be as good as compared to a forged knife balance, due to the fact that it is not too heavy and too light and uneven, depending on how it was made. The blade that is made for the stamped knife is usually much lighter and thinner in terms of thickness, so it is usually made for finer cutting. Q: How many kinds of knives are there? What are they? Q: Why do cutlery make good wedding gifts? It looks very classy, especially in terms of packaging. Newlyweds can use it as a starting point for their household. The symbolism of family togetherness can be traced in cutlery. Q: What are the types of utensil stainless steel grades? Q: What are the different types of knife edges? V-edge Has a simple v-shaped edge, also known as the straight edge knife. Compound bevels Has a similar style to the v-shaped edge but with a smaller v-shape on top of it. Convex edge Has a point in the end but slightly curved on the sides, so it looks like a convex. Hollow edge Has an outward point on the sides and sharp and pointed in the end. Chisel edge Has a single pointed edge, much like a right triangle. Serrated Has a serrated or jagged teeth edge, mostly seen in bread knives. Q: What are the nutritious benefits of steak? Q: What steak recipes are the most popular around the world? Steak Diane – with added fat, it has caramel and is quite like filet mignon. Q: Is it worth it to have a steak knife set? Great for guests Exquisites like the Dalstrong steak knives, Wusthof classic and any steak knives set will definitely be useful and attractive to your guests. Ideal for restaurants The same goes for restaurants, brands like Chicago cutlery, or Wusthof gourmet will definitely impress guests for the quality. All-around table and kitchen use If you have the best steak knives around then you can make use of them in any dinner table. Q: What is the tang of a knife? Full tang – this one is usually the most durable because the tang of the knife is thoroughly inserted into the blade handle for stability. Half tang – it is just half of the full tang and not nearly as durable or stable, but is usually generally cheaper and easier to find. Push tang – this one is a half or partial tang that has been pushed with epoxy or adhesive such as glue. In some cases, there are full tang knives with a push tang. Rat tail tang – this kind of tang construction makes the use of threaded pommel or bolts. It can also be fastened into a rod or the end of it. Encapsulated tang – this kind of tang has a molding that is unique to its kind. It is specifically shaped according to how the tang was formed, so that it can be more ergonomic. Q: What are the different handle materials found or used in knives? Walnut or wood Any kind of wood material is basically rustic and recommended for hand washing only. It is very elegant and adds significant weight to the knife. Stag A unique kind of handle material that is made from deer antlers. They can also be used in certain types of knives other than those in the kitchen. Bone Made from dead animal remains, these can also be used in other types of knives, much like with the stag material. Fiberglass (G-10) This is a kind of laminate that has been based on fiberglass, and is quite durable and does not take too much weight. Carbon fiber Carbon fiber is always a great material anywhere, and is also good in terms of ergonomics and handling. It is, however, a little more expensive than others. Micarta This is a kind of linen that is incorporated with resin, with a construction almost like that of G-10 but quite soft in feel. Zytel thermoplastic This is a kind of thermoplastic that has good surface texture so it is almost entirely resistant to breakage. It is also one of the cheapest materials out there. Titanium Titanium is superior to most metals and materials out there, but can be pricey. It is great for those who want high end cutlery in their restaurant or home. Aluminum Aluminum is very lightweight so it is perfect for those who need a lightweight kitchen tool or dining tool. The T6-6061 type of aluminum is best used for most handles for a knife. Q: What are some important table etiquette? Join the conversation in the table, or at least listen. Ask someone to pass whatever you need from the table. Make sure you only cut one food piece at a time. If you need to pick your teeth, excuse yourself to the washroom. Don’t play around or violently pierce your food. Finish chewing first before drinking or sipping soup. Avoid using your phone in the dinner table, and excuse yourself for emergency calls. Q: What makes cutlery so expensive? Higher grade stainless steel Steak knives can be quite expensive if they are made of quality razor blade of stainless steel. Workmanship Forged blades are more expensive than stamped blades. Design and packaging Most of the best steak knives are designed this way, to make it a great gift for mother’s day. Q: Why should you sharpen your knives? You can work on tasks easier and faster. Sharp knives can avoid bounce-back accidents caused by dull knives. If you know how to sharpen a knife, you’ll save bucks in the future. You can customize how you want your knife to be sharpened. Q: What are the different kinds of sharpeners for knives? Handheld sharpener This one is manual and can be dangerous if you don’t know what you’re doing, but can be great for experts who want to fine tune their blades themselves. Electric sharpeners This kind of machine is like a bread toaster in which you just insert your blade and have it sharpened automatically. Sharpening stones The good old fashioned way of sharpening your blades, the most common would be the silicon carbide and the aluminum oxide. Honing steel Also known as sharpening steels, they can be usually found in butchers and meat markets. They can be easily used by anyone looking for a quick sharpening technique for their knife. Serrated knife sharpeners These ones are specifically tailored to serrated knives, like those for steaks and for breads. Q: How do you safely hold this kitchen utensil? Don’t be afraid to hold on the top thick edge of the blade for leverage. Don’t pick up a just-dropped knife to avoid accidental cuts. Make sure your thumb and forefinger are gripped properly. Curl your fingers to avoid getting in contact with the sharp blade. Children and teens should ask a grownup to give cutting advice and safety. Q: Why are chefs so skilled? What qualities do they possess? Honed cooking skills Whether they use a chef knife or various cutting boards, they know their cooking skills well. Goal setting Chefs know how to set goals for their restaurant and their current menu. Know the costs They should know how to compute the initial costs of the recipe in their head. Be organized They know how to organize items and keep them functional, such as using sharpening steel for knives. Have discipline They should employ discipline in the kitchen workplace. Be appreciative Even if they are already in the front page of cook’s illustrated, they should know how to be humble so they don’t sound apathetic and strict to new cooks. Hardworking They should be hardworking, above all, to uphold the standards of the restaurant. Q: In a dining table setting, where should a steak knife be placed? A: A steak knife is usually and traditionally placed on the right side, replacing the table knife. It is usually next to the dinner spoon and can also be next to a fish knife, if present. Steak knives can also do other things that the regular table knife can do, anyway. Q: What are the differences between carbon steel and stainless steel? Q: What are some common steak preparation mistakes? Always know about the different steak cuts. Use the right pan to avoid warping. Keep the pan hot enough before cooking. Don’t cook straight from the fridge – let it thaw for 10 minutes first. Don’t turn the steak a lot. Consult a color chart to know if your steak is overcooked. Rest the steak for a few minutes before serving. Overall, the Bellemain Premium Set is our pick for the best steak knife set, due to the surgical blades made of stainless steel, quality serration for each of the blades, stability due to being full tang and durability overall.